We received some of these products for review purposes. As always all opinions are honest and my own. This post contains affiliate links. It is that time of year again. I am trying to figure out just how many Easter baskets I have to make, what each little is currently into and how to create the perfect basket without any candy included! Since Mar. 10th was MAR10 DAY, and we just hung out at the Nintendo Store in NYC for another fun event I thought I would start my Easter Basket coverage with some fun for the mini (and not so mini) gamers in our lives. 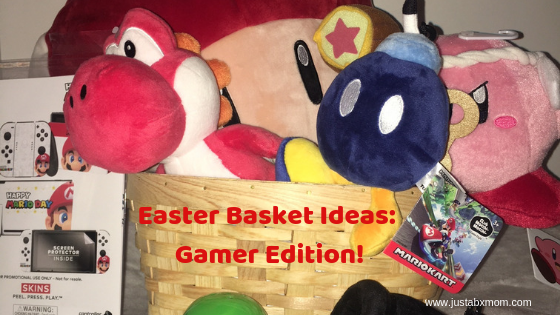 With us having spent so much time lately at the Nintendo store I decided to focus on a Nintendo themed basket for the mini gamers in my world. You can do a version of this based on any game or system. JustaBXgirl recommended doing a Fortnite version for her cousin that is obsessed. The Moose Toys collectibles that I showed you in my Toy Fair recap would be great for that one. Designed in Japan by TOMY, Club Mocchi- Mocchi- plush toys are super soft and huggable making them the perfect substitute for an Easter bunny. Seriously, I was online considering buying JustaBXgirl a bunny for Easter (breaking my no pets rule) but then realized that they lived for up to 12 years and I’m not sure I’m ready for that kind of commitment. Snuggling with a Mega Mushroom though? That’s a commitment that I’m ready for. I’m really into these Mario themed versions that are now available at Target because I was a HUGE Mario fan growing up. We’re talking Super Nintendo days. If you get a mega one your little can relax on it while they play a game. Speaking of gamer, what kind of gamer gift basket would this be if you didn’t include a game? We recently got to check out Kirby’s Extra Epic Yarn so it was an easy choice to add to the basket. Another fun option if you’re little has the Nintendo Switch would be Yoshi’s Crafted World. JustaBXgirl has been asking for a Switch for a while now. Sooner or later, I’m going to have to get her one. And when she gets one she will also want a decal skin for it. We saw some really cool ones at the MARIO Day celebration and thought it would be a great addition to the gamer Easter Basket. There are a lot of really cool ones available.